Team Rojas are Miami/NYC duo EDG4R & STRAVINSKY (aka Edgar Rojas & Erick Rojas). Known Edgar (left) a long time, even working together on a summer party we had a couple years ago called 'The Attic' at Jazid Tuesday Nights, along with Jonathan. Great guy and great taste in music! Don't know if I've met Stravinsky before, but definitely heard his name in our scene. Spinning around town at similar venues. 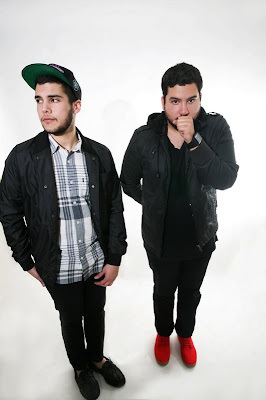 Team Rojas have just released a mini mix that they'd like to share called 'Before We Meet'. A precursor to the release of an Official Mix called 'Nice to Meet You' that is getting released on Turntable Lab in July! Way to go guys! Here's that mini mix in full 320! If you like what you hear keep an eye out for that full mix and check out Team Rojas spinning in the flesh this Wednesday 6/24 at The Standard for our weekly shindig around 10PM. They will be our special guests of honor. *** After The Standard (around Midnight) don't miss the Premiere of (786) next door at Purdy Lounge. 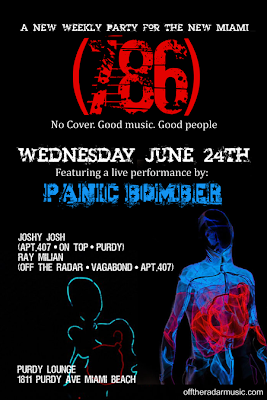 A New Weekly Party for the New Miami with a Live Performance by Miami New Times Best Electronic Artist Panic Bomber! He puts on a hell of a show, looking forward to it. Then dancing till the wee hours with your's truly, Joshy Josh & DJPJ! Can't wait!! C u there and every Wednesday thereafter. I have been waiting to get home to download this mix (stupid file sharing sites are blocked at work... ugh). Can't wait to pop it into iTunes.